The product are mainly made of metal such as iron powder and alloy steel powder. To improve the strength and additional performance, additives such as graphite powder and others metal powders are also used. In any case, only non hazardous selected materials are used. The additive powder and lubricant are mixed with the main material powder using computer controlled systems, Lubricant is added in order to prevent compacts from sticking to tools during pressing. Mixed powder is fed into the cavity of tools and compacted under a pressure of 300 to 800 Mpa. Green compacts are heated in a high-temperature furnace where the metal powder particles have solid phase bonding. 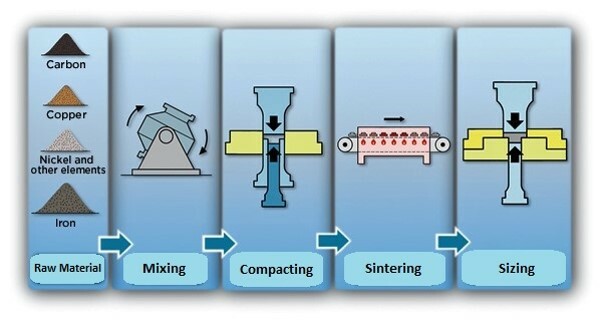 To ensure the accuracy of dimension of a product, after Sintering process continued to Sizing process.